Our first day in Kathmandu had me quickly feeling overwhelmed, from dust everywhere to cows sleeping in the street. And there are no traffic signals/signs, to cross the street you simply start walking and trust that motorbikes will avoid you. The dust and pollution make it hard to breathe, and smell the garbage lined roads it unpleasant. 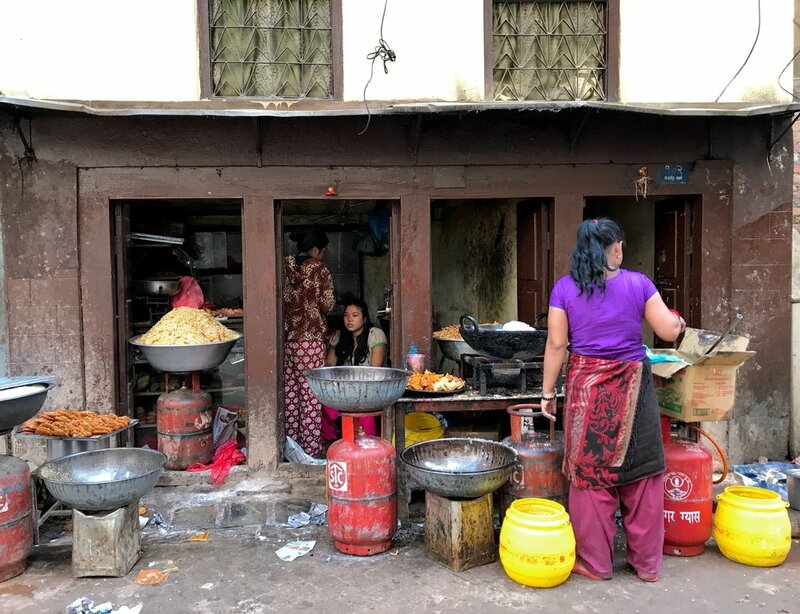 As I write this post, I am left wanting to know so much about the history of Kathmandu. It's here, on the road photographed above, that we met a young man named Sanjay. He approached us and asked to walk with us so he could practice his English. Wondering what he wanted, thinking one of two things: he wanted to give us a tour (for money) or ask us to buy something from one of the many shops surrounding us. Bill started talking to Sanjay with curiosity. It's not lost on me that there are new experiences I never let myself have while exploring a new city. I explore alone so much of the time that meeting Sanjay's mother would never have happened if I wasn't with Bill. But first, let's continue with the story. Sanjay spent the afternoon with us, walking down alley only locals know how to find. Where the streets are thriving with community. As we walked, he told us that he was born in India. His father was a shoemaker and moved the family to Kathmandu to improve their living. Sanjay received private education until grade ten, and has been in art school for five years. He's learning to paint Mandala. While we didn't get to see any of his paintings, we did visit his school. Ah ha, the school sells art to tourists. Does he want us to buy a painting? The next day, Sanjay asked us to come to his home. His mother wanted to meet us. He lives close, it's just a 15 minute taxi ride. Put yourself in my shoes, in a city I described moments before as a 'Mad Max' set.... a stranger asking me to trust him and travel miles from our hotel to meet his family. While Bill was excited, I was cautious. Traveling to Sanjay's home I whispered to Bill, 'how will we get back?' It was clear we were traveling to a residential neighborhood. Taxi's are not waiting for tourists. Moments later he told me he sent our location to friends back home as a precaution. I asked Sanjay if I could take a few photos, to share with my family and friends. I was humbled and grateful that he wanted us to see his home. Each family has a private space, one room, with one power outlet and no running water. As we walked 100 yards to his families home we noticed some homes with flat-screen televisions. Forty families live here, all with one room connected to alleyways. Kathmandu law allocates water throughout the valley. With the population jumping from 1M to 5M, and no development improvements, the solution is to allow neighborhoods access to fresh water a just few hours... once a week. This explains the barrels of water on rooftops - collecting enough water for a week. We spent about thirty minutes visiting before returning back to our hotel (we negotiated for the taxi to wait for us). Shanti, Sanjay's mother, prepared tea and sweets for us. A black tea with ginger, coconut milk, and sugar. It was so good that I drank Bill's. The home is cozy, clean, and organized. A place one can relax, enjoy, and take in this experience of a lifetime. Sanjay as two of his young siblings. Shanti wouldn't let me leave without a gift - gifting me traditional Hindu ankle bracelets. Sanjay told us we were the first 'white people' to visit their home. One of his brothers is ready to go to school but they will not send his to government school, concerned by exposure to drugs (at age six). One year of education at the private school costs $200 a year. This fee includes books, uniforms, and education. We are looking into setting up a scholarship fund to help the children in this communal home. We met Sanjay three times while in Nepal and have talked to him a few times since returning home. Sadly, a week ago we heard back from Shanti, her preference is to send the boy to India for private schooling. This has put a wrinkle in our plan but we will continue to explore our options.